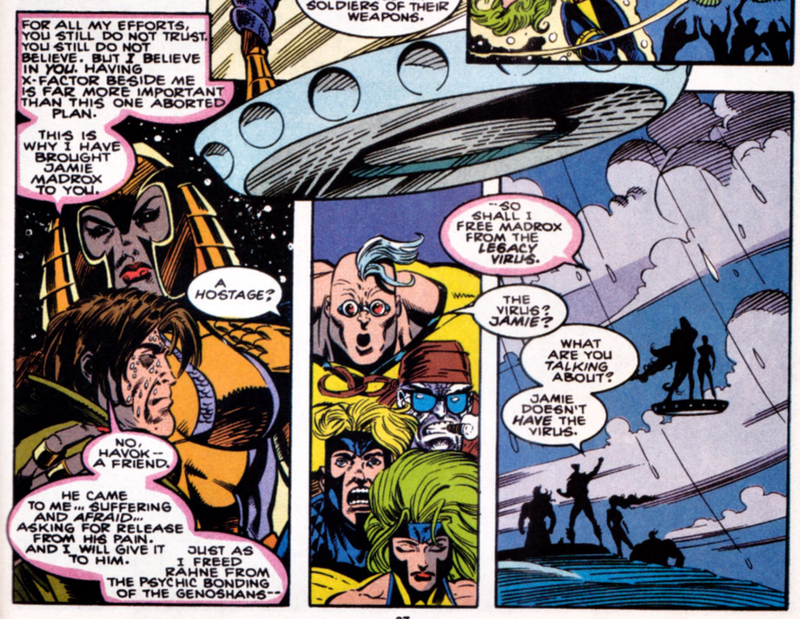 In the wake of having cured Wolfsbane, Haven once more entreats X-Factor to join her. 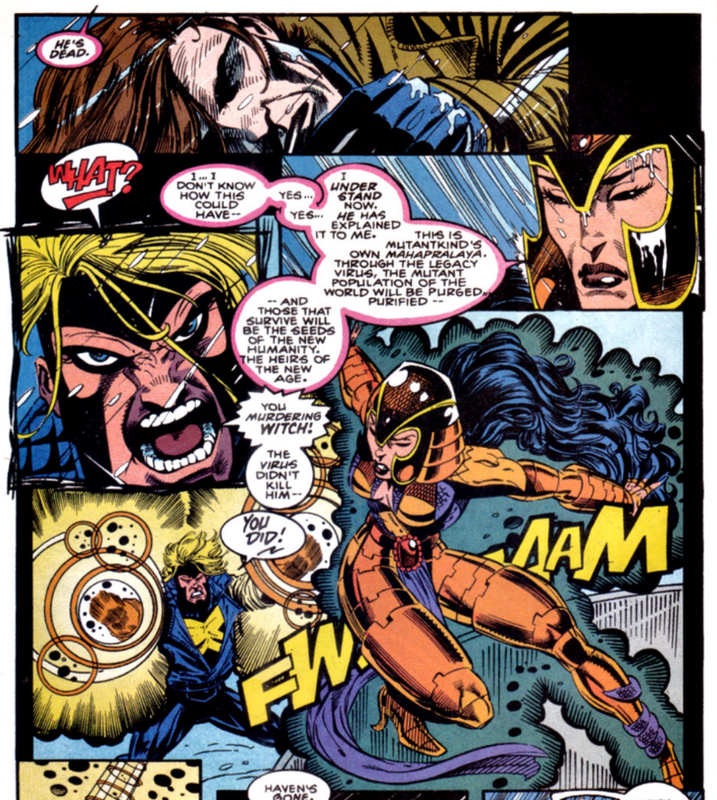 But when she reveals that she has a satellite poised to trigger multiple earthquakes around the world, triggering her world-ending Mahapralaya, Havok decides he's through reasoning with her, and orders X-Factor to arrest her. 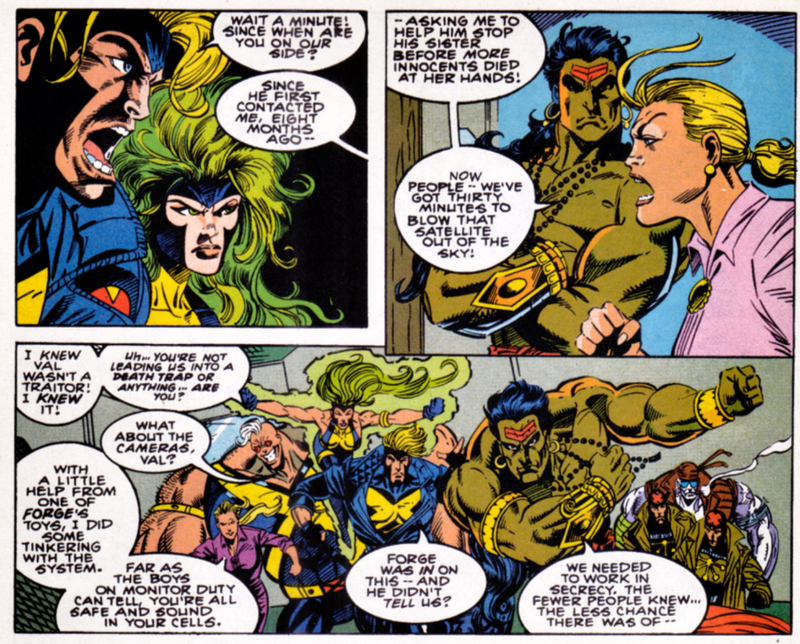 But Haven simply transports the group, save Wolfsbane & the Madrox duplicate enamored of her, onto another plane of existence, and when they emerge, it is inside a holding cell. They are unable to free themselves, but the cell door is opened by Haven's brother, Monsoon, who has been secretly working with Val Cooper to bring Haven down from the inside. However, her troops, led by the Madrox duplicate, intercept them, and a fight breaks out, during which an increasingly-sick Madrox slips away to find Haven. With the rest of X-Factor holding off Haven's troops, Val & Monsoon lead Havok & Polaris outside, where they use their powers in concert to destroy the satellite before it can do any damage. Just then, Haven appears, carrying a dying Madrox. 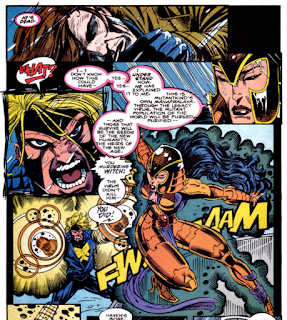 She tells Havok he is sick with the Legacy Virus and came to her for help, but only Havok can decide if she helps him. He reluctantly tells her to do so, and she takes him to the same plane where she took Wolfsbane, emerging a moment later declaring Madrox healed. But he simply falls from her arms, dead. 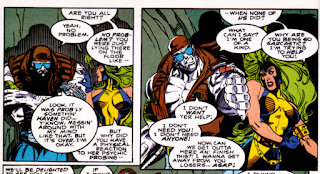 Haven realizes that the Legacy Virus must be mutantkind's own Mahapralaya and teleports away, leaving an anguished X-Factor with the body of their teammate. After teasing it on and off for roughly nine issues, Madrox dies in this issue, succumbing to the Legacy Virus with Haven unable to cure him as she did Wolfsbane in the previous issue. This makes Madrox the most high-profile character to die of the disease to date (since he's actually a main, recurring character in one of the books), but of course, he eventually returns from the dead (since this is the 90s, and the character's name is "Multiple Man", this is hardly shocking). While his actual return is not all that far off, once he's shown to be alive, he actually disappears into comic book limbo for awhile, before eventually being dusted off and slightly reimagined in the early 00s, becoming the leader and main character of a new iteration of X-Factor under Peter David. So for all intents and purposes, despite the character's relatively imminent return from the death he suffers here, this really does mark the end of the character as we've known him in this series. 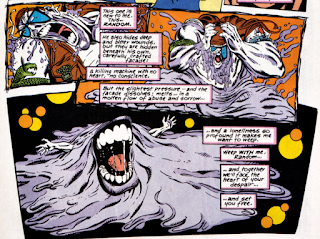 Haven, finding herself unable to cure Madrox of the Legacy Virus, declares it to be mutantkind's own Mahapralaya (her prophesied "thinning of the herd" that leads to the birth of New Humanity), in a way that suggests she's just covering for her own inability to overcome it. Regardless, it's a mildly intriguing idea, though of course, no one else is quite as keen on Haven as DeMatteis and the character mostly disappears after this (she appears in two more issues after this one, to date), so nothing really comes of the idea. It's revealed here that Haven's brother Monsoon has been working with Val Cooper and the government to bring Haven down (he believes in Haven's spiel, just not the whole "wipe out 90% of humanity ourselves" part). While it could have used more time to develop (and it's almost laughable the way their insurrection doesn't even last a panel before Haven discovers them; it cuts from Monsoon leading X-Factor out of the cell to the group being stopped by Haven's troops in the next panel), it's a reasonably interesting twist; Val being in on it is hardly surprising (given how out-of-character her falling for Haven seemed), but having Monsoon (who is kind of a jerk regardless) be working with her adds a little something to it. Haven says she's been blessed with second sight since childhood, which doesn't quite gel with the later reveal that she derives her powers from the fetus inside her (since it seems doubtful she'd be carrying the fetus as a child). 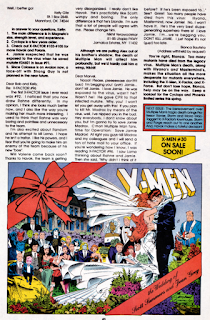 This issue being a number divisible by 25 published in 1994, it is double-sized and features a red-foil embossed cover (in a layout similar to that of the Sabretooth & Deadpool limited series, with a central image on the right and a column of text on the left). It also shipped to newsstands with a "regular" non-enhanced cover and a $1.75 cover price (instead of $2.25). If anyone cares, Monsoon's first name is given as Aloba. Haven's is Radha. After having to physically pull himself back together upon emerging in Haven's cell, Polaris shows concern for him, which he gruffly rebuffs. Towards the end, the only dupes Madrox can summon come out with blank faces devoid of features. Everybody who didn't know (or hadn't figured out) that Madrox was sick with the Legacy Virus finds out here, shortly before he dies. 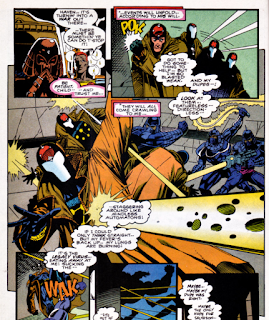 When Haven sends X-Factor onto another plane of existence midway through the issue, it results in some surreal, cartoony art that also enables DeMatteis to go on a tear talking about the psychology of the characters (as they are "broken down" and rebuilt upon emerging back in regular reality). This issue runs a two page letter column (with the bottom half of the second page devoted to a reproduction of the cover to X-Men #30, serving as an ad for that issue and the wedding featured therein). 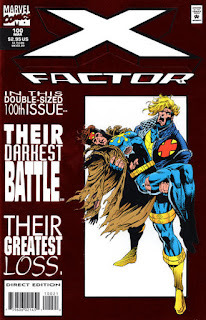 About halfway through this issue, X-Factor (sans Wolfsbane) is thrown into a cell inside Haven's base of operations, and Polaris, leading the charge to escape, expresses her frustration with all the New Age mumbo jumbo, and declares its time for action. Her dialogue more or less echoed my own thoughts on the issue thus far, which spends the first half of its pages more or less trodding over familiar ground: Most of X-Factor wants to arrest Haven, some of them don't, Haven spouts a bunch of flowery platitudes & pronouncements while also talking about wiping out vast swathes of humanity, which somehow doesn't immediately turn off the few (theoretically reasonable) people still supporting her. Lather, rinse, repeat. 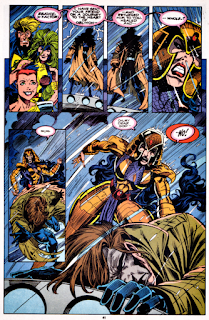 That all being essentially what happens to some extent in the previous two issues, it reads very much as if DeMatteis had mapped out his story, then was told the final chapter was going to be double-sized, so he decided to just rehash the Haven argument to kill some time before getting to the actual climax of the story. The second half of the issue, then, is much better. 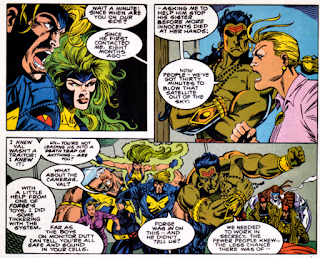 I mean, no one (rightly) gives a crap about Haven's brother Monsoon (or even remembers he exists), but the reveal that, while he's a jerk, he's not a "let's kill off most of humanity" jerk is fun, and X-Factor taking down Haven's satellite is a fun, retro "combine our powers" bit (and Haven having a "earthquake-triggering satellite" in the first place is also fun in a retro/Cobra-y kind of way). And, of course, Madrox' death, while hardly shocking (having been teased for almost a year's worth of stories) was nevertheless effectively executed. Having Haven cure Wolfsbane of a very scientific problem (at least in terms of comic book science) in the previous issue, only to have her fail when trying to do the same to Madrox, is a great use of serial storytelling, adding an additional layer of protection to Madrox along with the genre convention that heroes usually survive at the end of the day. It makes Madrox' death, for all its foreshadowing, that much more of a gut-punch, since we'd just seen Haven successfully "cure" Wolfsbane. It's a shame there was so much retread material to slog through to get there, but the ending of the issue mostly redeems it. Ultimately though, in hindsight, this issue is barely momentous: this is more or less the last hurrah for Haven, one of those villains who barely outlasts her introductory story, and Madrox will, before long, be back (and much longer after that, go on to even bigger & better things than he was doing in this series up to this point, somewhat devaluing his "death" here). But at the time, Madrox' death felt like a big deal, and though there's a fair amount of bloat to this issue, it really does sell that notion, making the death, for all its obviousness & ultimate superfluousness, still feel like a gut punch. Tomorrow, Wolverine runs afoul of Cyber in Wolverine #79. Next week: X-Men (vol. 2) #30 and X-Force #32. I kind of like Monsoon. He puts perfectly into words his reasons to oppose Haven actively bringing on Mahalapraya at her own chosen time even if he fully buys the concept itself and the prophecy. Well, not perfectly, because he doesn't use 'hubris', but close enough. "Haven says she's been blessed with second sight since childhood, which doesn't quite gel with the later reveal that she derives her powers from the fetus inside her (since it seems doubtful she'd be carrying the fetus as a child)." Maybe she was lying- she didn't want to reveal the truth about her son. Don’t have anything else to say about this issue but I’ll reiterate my opinion from a previous post that, even if one considers “a number divisible by 25” to be a fairly bogus milestone the other ¾ of the time, 100 strikes me as a legitimately significant milestone in our culturally accepted numeral system. I was really tired of how dark all the Marvel books were becoming at this time. Between this and Spider-man taking two of my favorite light hearted characters and turning them dark and broody, I dropped a lot of Marvel books at this time. Peter backhanding MJ and the dark tone of Spectacular ended all my Spider-Man buying and I never went back. I stayed with X-Factor through AOA and dropped right after. I disliked the art during this time even though looking back it wasn't bad, it just wasn't Joe Q and Larry S.